Rejoice fantasy fans! This Sunday marks the return of Game of Thrones on HBO. 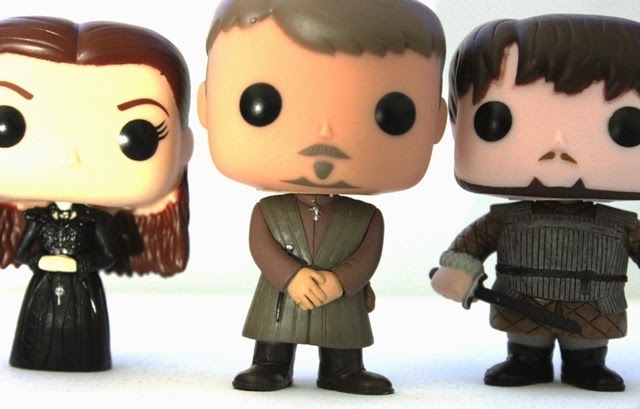 To celebrate Season 5 of the television show, I'm reviewing Series 4 of the Funko Pops! It's a 3 for 1! But wait, you say! Why only 3? Aren't there more figures? Right you are imaginary voice, right you are. 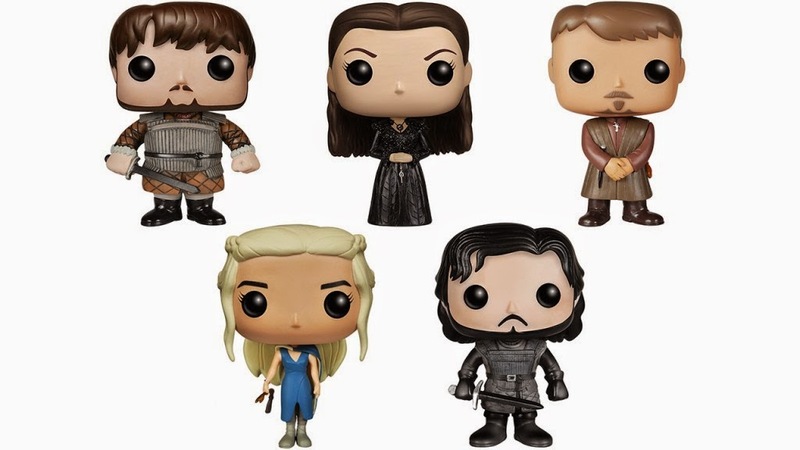 There were in fact 5 figures released in series 4 (4 which made it to the back of the box art). So, am I slacking? No, my friends. I have resisted the urge to be a completest and kept to my one of my many rules of Pop! collecting. Arbitrary Rule #1: I only need 1 version of each character. 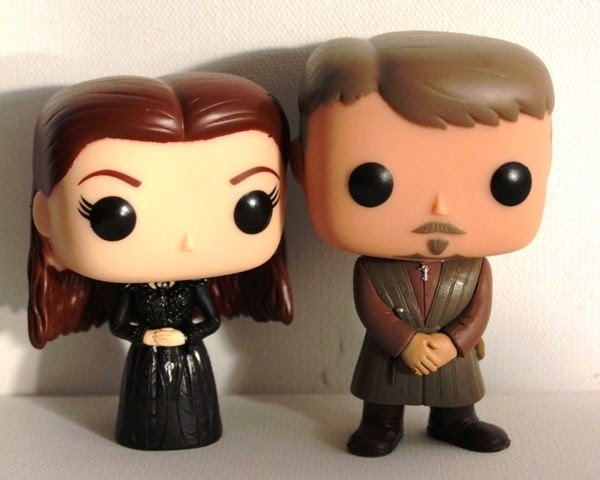 Instead of doubles, I've added 3 more characters to my collection: Sansa Stark, Petyr Baelish, and Samwell Tarly. How well do they stack up? I was pleasantly surprised. I've been waiting for Sansa since the beginning. Yes, her character started off a little humdrum, but she's grown more than most. I hate the hate she gets from fans and was afraid she'd be overlooked by merchandising (like say, Bran). Her transformation in season 4 from pawn to player of the game was the perfect opportunity to release a figure, and while I'd still like to see a Sansa not as Alayne Pop! I enjoy this doll a lot more than I expected. 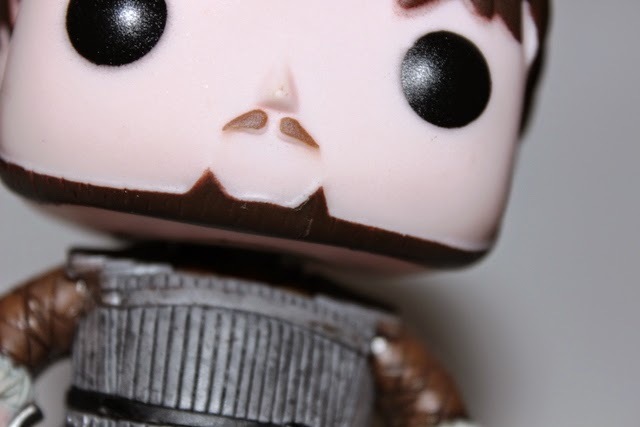 I was afraid this figure would take away all of the Sansa from the character. The promotional art showed very very dark hair, but the actual doll's hare is a very deep auburn. 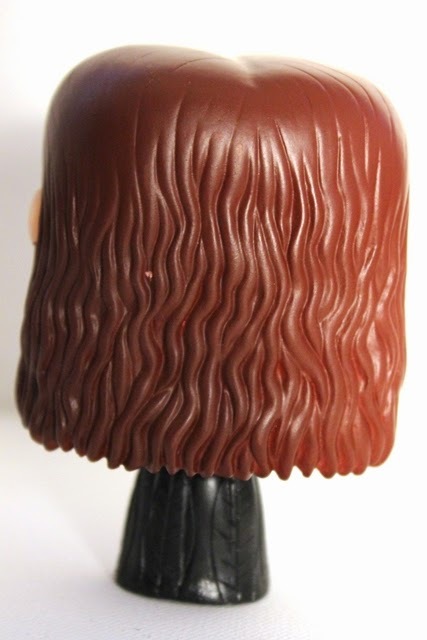 It's closer to Catelyn's than Sansa's original colour and I enjoy that parallel. The paint has a few problems, which I alluded to in the Will Graham review. The paint around the ears and on the under side doesn't quite touch the hairline. You can see it in the angle above. There's a little bit running on the forehead but not much. The sculpt itself is quite basic--waves down her back pulled behind her ears. 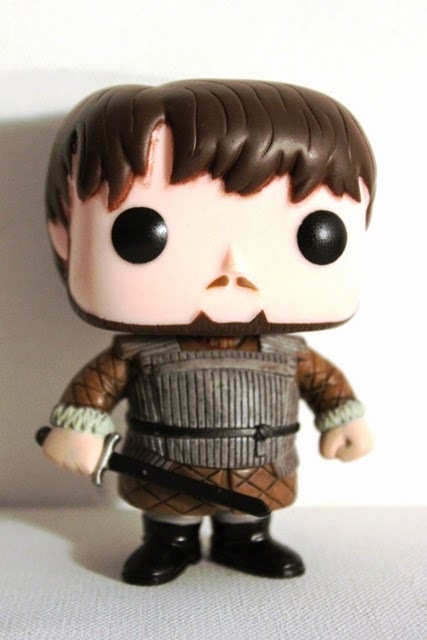 Just think of the craziness they could have done with a basic Sansa doll. Maybe we'll get some creativity with a Margaery. 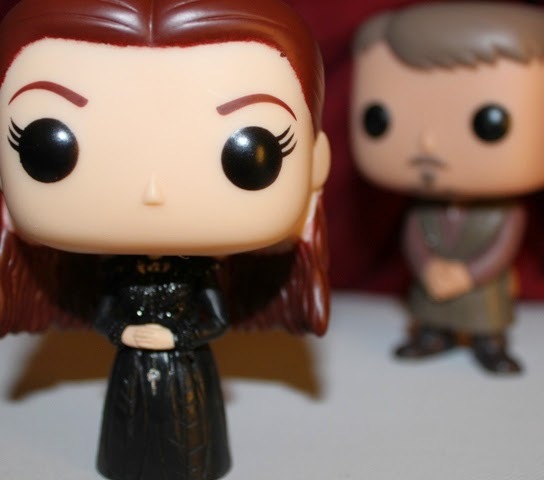 Dear Funko, we still need a Margaery. 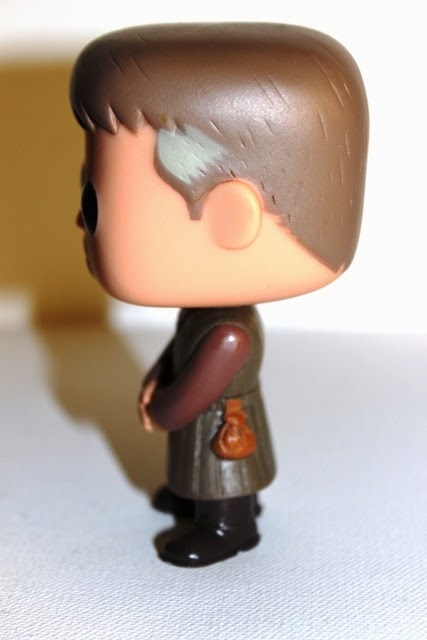 Sam's hair paint also runs a bit around his bangs but that's the only paint problem I can see. For a man who has taken the black, there sure if a lot of colour used on this toy! 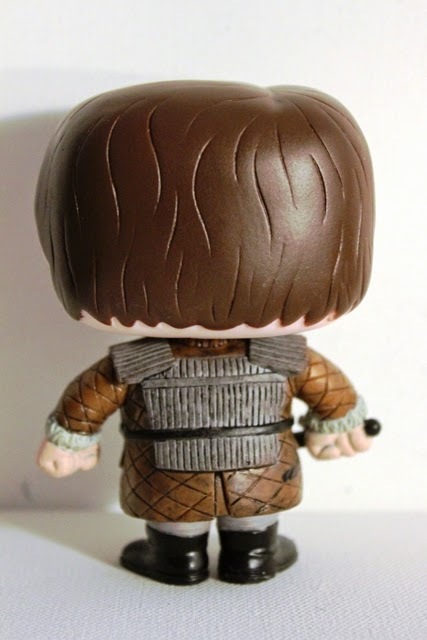 Sam's hair is simple but the absolutely painstaking detail on his outfit is astounding. Layer after layer and texture after texture, each one with a different paint and pattern. I love him. He holds his sword tentatively and his tiny mustache give just a hint of bewilderment. 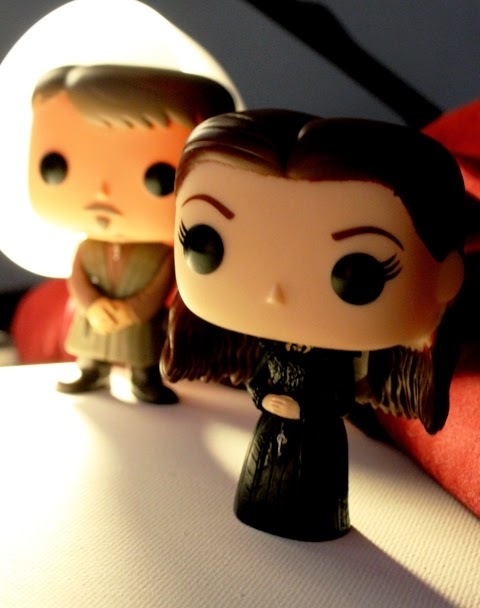 Littlefinger, on the other hand, is all business. This figure exudes the cool confidence of Petyr Baelish, from the ease of his pose to the quiet details throughout. The pleats in his mustache and beard, the tinge of grey at his temples, the knife tucked discretely under his arm--everything about him is just slightly under the RADAR. 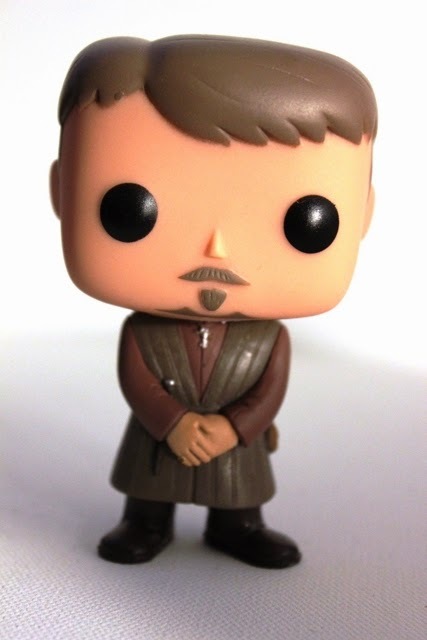 Perfect for Littlefinger, and it makes me love this figure even more. It helps that his paint (I can't believe I'm saying this) is great! All of the body moulds are really well thought out. 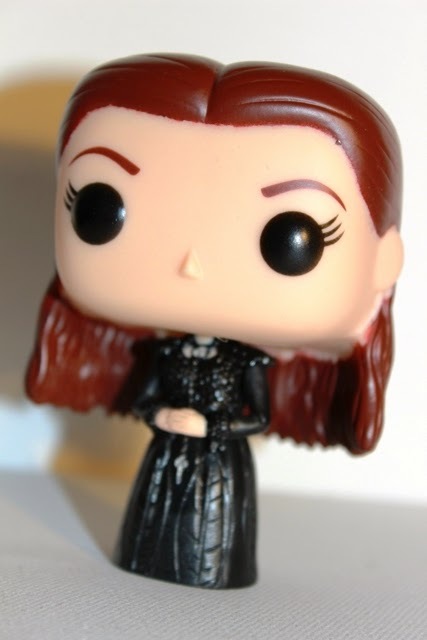 Sansa's dress is pure black but the feathering on the shoulders, bust, and cuffs stands out splendidly. The silver jewelry pops against it. Just because it's black doesn't mean it needs to be boring. Sam's armour is a hodge-podge of material and you can see exactly how it's put together. The hard pleats on top of quilted fabric is reminiscent of Sam's first scene in the series. The ruffled sleeves make me laugh. Littlefinger's clothes aren't flashy but they're pristine. The colours could be boring but there's just enough detail to draw the eye. He has a goldring, dagger, money purse, and of course, his mockingbird pin. I also really enjoy the subtle way Sansa mimics Petyr's mannerisms. Look at his little protege! For me, series 4 was a success, with or without the repeats. There are so many interesting characters in Game of Thrones. I just don't see the point of re-releasing the same ones over and over. Who do we have coming up next? ...Well, it looks like I'm breaking Rule #1. Nice review! It's funny how you can easily recognize these characters even though their facial features are so minimal, lol. I have to say, Sansa was the hardest for me. I don't think she resembles much of her live character, but they probably did they best they could. Maybe a different hair style would've been better? Either way, I'm very excited for the series premiere on Sunday!